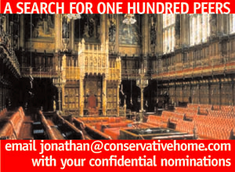 "Since Mayor Boris stood down as MP for Henley on his election to run London last summer, Parliament has been without a member of the Johnson family - something which could be put right by nominating his father, Stanley, to the House of Lords. "However, Stanley shouldn't be there on account of being his son's father, but in his own right as a Conservative politician with a wealth of life experience to contribute to the proceedings of the Upper House. "Having worked at the World Bank and the European Commission in the 1970s, he was a Conservative MEP for one term between 1979 and 1984 and unsuccessfully sought election to the Commons in Teignbridge in 2005. "His wealth of expertise is centred around his interest in animal welfare and the environment, about which he has written a number of books and won plaudits aplenty. He is currently an Ambassador for the United Nations Convention on Migratory Species and has travelled across the world pursuing these interests. "His presence in the Lords would add great value - and humour - to its deliberations." Stanley is probably the most spritely 68-year-old I know and I think it would be tremendous to see him in the House of Lords. You can read more about his life and work on his website.